Leading off today: There are still operational logistics to be worked out, but the New York State Public High School Athletic Association championships in nearly all sports will finally be available to residents across the entire state beginning in November. In fact, anyone wit Internet access across the nation and most of the planet will have access to live streaming, the NYSPHSAA and the NFHS Network announced Thursday in disclosing a 10-year agreement that will make the content available online as a pay service. "In this day and age, people expect streaming," NYSPHSAA Executive Director Robert Zayas said. "There's an expectation of maybe grandparents being in Florida and being able to see the contests from New York." Zayas said the NFHS Network collaboration culminates nearly three years of work on a streaming plan, some of which was complicated by the existing 10-year, multi-platform agreement with Time Warner (now Spectrum, owned by Charter Communications). 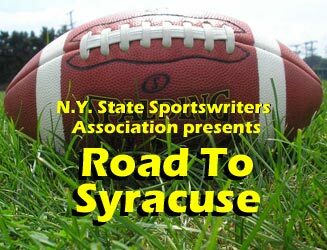 Spectrum will retain the cable TV rights to the NYSPHSAA postseason in a re-worked deal. The cable company's grip on exclusive rights made championship cablecasts in sports such as football, basketball. wrestling and hockey unavailable to much of downstate, including large cable systems in Long Island and New York City. Now, all will have access via streaming, the hot delivery option of the moment in the world of sports. The NFHS Network already has various five-year agreements in place for regular-season and sectional coverage plans with Sections 2, 3, 5, 6, 7, 9 and 10. Quality may be inconsistent at the local level, particularly in the first couple of years with student video clubs potentially responsible for streams of their schools' regular-season contests, but the plan for state tournaments calls for NFHS Network to partner with production companies to assure a product worthy of the subscription fee. NFHS Network, which has content deals in place with scholastic governing bodies in 43 states, charges $9.95 for a single month or $60 annually for access to all of its streams. "The NFHS Network is enthusiastic to work with the New York State Public High School Athletic Association," NFHS Network CEO Mark Koski said in a release announcing the deal. "We appreciate the opportunity to show the scope of what the NFHS Network can do; making live games accessible to spectators from around the world is just the beginning." More on streaming: It remains to be seen what Spectrum will choose to show in the postseason. After a massive expansion into streaming regular-season football a year ago, they pulled back in many aspects of sports coverage across their upstate systems. Still, their original deal with the NYSPHSAA in 2013 was groundbreaking for New York high school sports and Zayas was effusive in his praise, calling the company "a wonderful partner for a long period of time." However, Spectrum's business model has changed, and so too the NYSPHSAA is making adjustments. One of the adjustments is financial. Though not citing specific numbers, Zayas acknowledged that the combined money from NFHS Network, which will pay a flat rights fee for now, and the reworked Spectrum deal comes in lower for now than the old cable deal. That could change with potential revenue sharing from NFHS Network down the road. • Streaming most definitely opens new doors. Bowling, swimming and track and field are examples of sports championships not previously shown on cable but of potential interest to viewers. It would certainly be complex, but I could also envision a setup one day in which field events and running events at the track meet were handled via separate streams. On the other hand, it's hard to imagine golf, cross country or nordic skiing getting their moment in the sun because of the daunting logistics. resulted in Friday's game at Broadalbin-Perth being called off. Gloversville at Ballston Spa, scheduled for Sept. 7, was postponed because of two confirmed cases of Coxsackievirus at Gloversville. They were able to play the game the following Monday. Milestone: Oppenheim-Ephratah-St. Johnsville girls soccer coach Zale Benton collected win No. 300 in her 33rd season as the Wolves edged Fort Plain 2-1 on Wednesday. OESJ is 4-1-3 this season. Benton guided St. Johnsville to a NYSPHSAA championship in 2000. Too much? Last weekend's Class D football blowout was still the topic of conversation on the eve of Week 4 action. The Democrat and Chronicle and the Livingston County News both wrote Friday about Alexander's 90-14 rout of Geneseo, which almost certainly set a record for margin of victory in a game between state-ranked teams. "I hope that the people involved in that game have the ability to take a step back, possibly explore and do things differently," Section 5 football coordinator Scott Barker said. "A game like that does not help the sport of football." To be sure, there's plenty of blame to go around. Even after building a 60-14 lead by halftime, Alexander threw for a touchdown in the second half and again for a first down after already tacking up 82 points. On the other had, Geneseo coach Tim Dolgos rejected the offer of playing with a running clock. Small rosters left both teams with few options for benching all of their better players, and Alexander coach Tim Sawyer didn't relish the idea of repeatedly sending running backs up the gut against 300-pound defensive linemen. "It looks brutal, but Geneseo can't have it both ways," Sawyer said. "The bottom line is that many people know we offered to play the game with a running clock, they refused. The Geneseo coach chose to play football. As far as I can tell, there were starters (in the game) well into the fourth quarter, on both sides of the ball." Dolgos was influenced by a desire to not send a message to his players that he was quitting on them. "We were not in a position to be physically overmatched," he said. "I just gave them a talk about how we have to win the third quarter, that I'm trying no matter what the score is." More reading: I got my first real taste of eight-man football last weekend -- and I liked it a lot. I wrote about what I witnessed in my weekly column for PressConnects.com, also offering up a couple of rules suggestions that might make the game a bit better.